A couple of western media sources recently profiled a Maoist revolutionary from Andhra Pradesh, who calls himself "Gaddar," after the anti-Imperialist revolutionary movement from the 1910s. 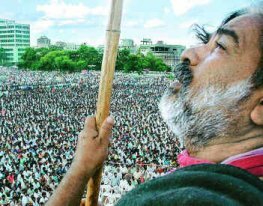 Through his powerful folk songs about poverty and political repression, Gaddar has become the police's biggest nightmare as they attempt to squelch the seemingly bottomless (or at least very deep) well of sympathy for the Maoists in India's impoverished rural areas. Maoists have been engaged in a longstanding civil war in rural areas in eastern and southern India, which stands as a stark rejoinder to recent upbeat developments in the cities. It started as "Naxalbari" in the late 1960s, but it has been reborn in the 2000s as the People's War. It has, by any measure, been an extremely bloody insurgency, which has left thousands of people dead in the past few years. PM Manmohan Singh recently described the movement as the current greatest threat to India's internal security. You can hear Gaddar singing in this NPR segment. You should really give it a listen; the guy has a voice. And there is a print version of the article with many of the same details and background at the VOA. It's not clear to me whether Gaddar is himself an active "soldier" in the People's War, or simply a Maoist sympathizer; most articles on him describe him as the latter. What to do about him? On the one hand, his singing ought to be protected as freedom of speech, and the lyrics of the songs in the NPR piece are all about suffering, not incitement to war. On the other hand, isn't he indirectly inciting people to commit acts of violence simply by supporting the Maoist movement? A lot of the media sources are spelling it "Gaddar," without reference to the Hindi meaning. For instance, go to the Frontline article (click on the picture). Thanks for your insights and the link. Amardeep, I dont know whether you've looked at general media coverage of naxalites in the Indian press/TV - Apart from Frontline, which has done some insightful pieces, there simply isnt much coverage of the underlying issues, causes except to simply report on the violence. Which makes it all seem to an urban reader as if it is just petty mindless violence. I am sure it goes much deeper than that. Amardeep, this piece on Gadar might provide a more nuanced view of both his work and the complexities of the Maoist/ Naxalite movement. I share your discomfort with the violence and the killings that have been an inextricable part of the Naxalite movement and the Maoist agenda. But like all revolutionary movements, this one had its roots in terrible suffering, and Gadar is one of those who responded to the injustice he saw at ground level. He occupies an interesting position; he's been called in--by the Indian state--as a mediator on more than one occasion, and his writings and poems deserve to be more widely known. Apu, I agree. In fact some rural areas in India are desperately impoverished, and the government seems to be able to do little to correct the situation. One can see why people go to the CPI-M, even if we don't agree. But the Maoists are a pretty nasty bunch. I've seen half a dozen stories this spring reporting on one atrocity or other they committed. But in the thread on the Sepia Mutiny version of this post, some people who know more about this guy weighed in, suggesting he's moderated his stance in recent years. He used to appear in public with a rifle, now he appears with a lathi. According to those commenters, he also now advocates only nonviolent resistence, and has evolved into a kind of "Gandhian" voice. Even if all that is true, I still feel ambivalent about him. Thanks, I was writing my comment as you were writing yours. I'll check out the links. And actually someone did translate one of his older Telegu film songs here. The naxalite movement in Andhra Pradesh has been present in some form or the other almost since independence. The present one is its latest incarnation. You are right that there are underlying reasons. The poverty in the regions of Andhra where this movement is strongest is severe. Available economic opportunities have not improved very much since several decades ago, at least in those parts where I have some personal knowledge of (Mahbubnagar Dist). I agree that extreme suffering is the backdrop in which the maoist movements have formed. However, the Maoist movements that are presently taking hold are quite different from the naxalite movements of old. Gadar belongs to the old school, and probably is aware of this difference. The maoist movement of today is considerably more brutal and ruthless even with the people who would form its support base. It is also extremely well organized and dangerous. I suspect many of the old guard realize this. They have also been marginalized in the new Maoist movement. Gadar's colleague Kondapalli Sitaramiah had already become marginal when he died, for example. I think it would be wrong to underestimate the threat posed by the Maoists, and I don't think the suffering and impoverishment seen in many parts of India are any justification for their action. The traditional communists (in WB for e.g) are themselves greatly exercised over the maoist threat with good reason. Today my friend came to me told me that "Amar, How do u publish so many article on diffrent blogs." I was surprised at this and told her let me see.....And i have made a serch, then i come to know about what exactly the matter was.....! U might be not getting what i m saying, it all happens b'cause mu name is also Amardeep Singh. I agree that there are several complex issues behind the Moist/Naxal/PWG politics. But Gaddhar phenomina should be seen from cultural angle. In Andhra popular performance arts like drama and others are virtually dead! The only popular art form of Andhra, cinema, if you may, has been in the hands of one or two casts. Gaddhar is the only face/voice on stage from a vast under-represented section of the society. I have known many friends who trust the effectiveness of the Indian democracy still respect him as their artistic represeantative. Can you seperate his politics from artist in him? my friends say yes they can! You ask any police officer from Telagana, privately, about Gaddhar's effect on even the moderate sections of social underclass. Let me add some stuff to this blog, Iam born and brought up in telangana. I saw the movement ups and downs and its transformation from ideology to present state. Gaddar, KSR etc, all these people belong to old guard who lived by their principles, the idealogy of KSR and Gaddar cannot be questioned, having said this there are many instances where gaddar deviated from ideology at least these days. In early stages of movement when KSR donated his appr 20 acres of land to dalits and started the movement, the idealogy was so certain and glamorous that many young brilliant students like gaddar from OU engineering college (one of the best colleges in AP) and some from REC(one of the best colleges of india) and Kakatiya university medical college joined the movement and sacrifised their lifes. Fortunately gaddar was moderate voice of the movement and spared by Vengal rao (then CM of AP). Though there was lot of injustice done by landlords (booswamy) towards dalits in telangana in those days(from 60's to late 80's), nothing is seen these days. The poverty angle of gaddar's voice and concern is no longer valid, even he himself knows about it and everyone from telangana knows and understands about it. In fact it is opposite now, i myself saw many instances where upper class people beaten by naxals just because there was a complain from lower class person/sympathizer, though there was not a valid or sound arguement. In conclusion, all i want to say is Gaddar is an old gaurd and want to live by his ideology(or so called) but not today's valid or acceptable theme. He has a nice voice and his work in intial days came from his heart and literally lifted people from feet(this is very true, to feel it you have to listen to his songs), but he is sitting on a successfully failed ideology. People like him should spend their time and voice towards educating poor people about literacy, HIV etc, in fact they have the power to do it. By the way he is very respected person in massess in telangana.